Although the direct causes of preeclampsia are unknown, there are some things women and their doctors can do in regards to management of preeclampsia. Because delivery of the baby is the only cure for the condition, it is important to manage it properly so the baby has a longer gestation period. These are just a few things that doctors will consider when making the diagnosis. Fewer than 10 percent of pregnant women end up with the condition. Women who are diagnosed need to take certain precautions to make sure they and their babies are safe. Once a pregnant woman has been diagnosed with the condition, she and her doctor should discuss what needs to be done to manage the condition. Regardless of how the preeclampsia is managed, the baby eventually needs to be delivered for a complete cure of the condition. One of the ways to manage the condition is to simply induce labor. This is usually done once a baby has reached at least 36 or 37 weeks gestation age. If there is incredible strain on the mom and/or baby, labor may be induced earlier after medications like steroids have been given to help speed lung and other organ development. The baby can be born either vaginally or through a cesarean section depending on the doctor's assessment of the baby's health. The mother may receive medications during labor to help control her blood pressure. Magnesium sulfate is often given so seizures do not occur. Women who are diagnosed with preeclampsia before their baby is fully developed may end up wanting to prolong the pregnancy. While this can help cut down the risk of premature birth, it can also lead to other problems. Weeks 24 to 34 are considered a medical "gray area" when doctors are unsure if delivery could help or hinder the health of the baby. 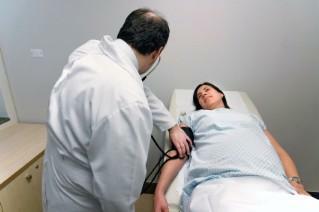 No matter what treatment a doctor prescribes, once preeclampsia has been diagnosed, women are very closely monitored. Weekly, biweekly, or even daily prenatal check-ups may be required for those not hospitalized to check for changes in blood pressure, weight, and urine. Women who have preeclampsia but do not take the time to manage their condition properly are placing themselves and their babies at risk for complications that can even lead to death. Although management of preeclampsia cannot guarantee a riskless pregnancy, it will help cut the chances of having any of the previously listed conditions occur. Both mothers and their babies face serious consequences if preeclampsia goes undiagnosed or unmanaged. Little is known about the direct cause for preeclampsia, and even a well-managed case often ends in an early labor inducement. Luckily, many concerned scientists, doctors, and researchers have been conducting studies to find better treatments for managing the condition. Women should not attempt to manage or treat their condition without consulting with a doctor. Women who are interested may be eligible to help out a clinical trial with a promising new drug. Those who may want to do so should consult with their doctor to find out if they qualify.